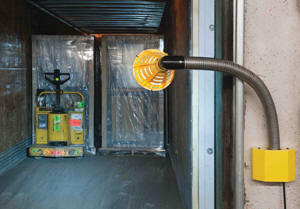 Lights minimize freight damage while expediting loading and unloading operations. 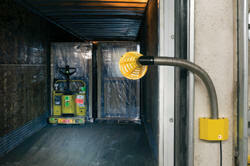 Provides uniform visibility inside trailers or around dock areas. Model LL-SAI and LL-SAF are ETL C/U.S. listed, while all others are UL listed. Series LL, offer good color, low replacement cost and turn on instantly even in cold environments. It utilizes up to a 100 watt incandescent bulb, (not included) or a Halogen Bulb model PAR-38-90, sold separately. Adjustable arm knuckle joint allows vertical and horizontal positioning. Halogen Lights, model HLGN-40, typically provides more lumens/watt, better energy efficiency, has a longer service life and experiences less light depreciation over its lifetime. It is supplied with a 500 watt bulb. Full illumination is instantaneous. High Pressure Sodium Lights, series LLS and AALLS, offers much higher lumens/watt output and a very long lamp life. Its illumination color rendition (yellowish) is not as desirable as an incandescent. It typically requires several minutes to turn on, and even longer if in a cold environment. Low operating cost. Spun Aluminum Dock Lights, stays cool to the touch. 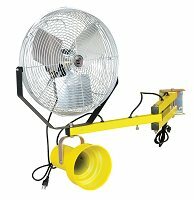 Units with strut arms offer both horizontal and vertical adjustments without tools. Available in a standard incandescent lamp head utilizing a 300 watt bulb (not included, series LL-SAI or a fluorescent lamp head (bulb included) series LL-SAF. Model PDF Description Length Wt. Rugged, heavy duty LED Dock Loading Lights provides brighter light than an incandescent light source while only using 18 watts of power. Encased in a cast aluminum housing with shatter resistant polycarbonate lens cover, these units instantly reach maximum light output. 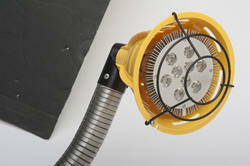 Light head is IP66 rated; can be sprayed down. Expected life of 50,000+ hours; 5 year warranty. UL listed. 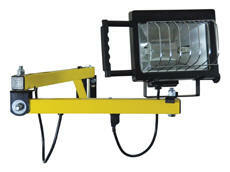 Reduce broken bulb and high maintenance costs with LED Dock Loading Lights. These use 80% less energy than incandescent or halogen bulbs. 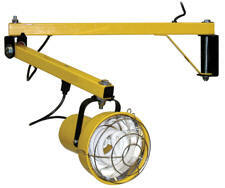 Achieves maximum light intensity instantly, and light is optimized for trailer illumination. These LED lights have no fragile filaments to break, eliminating the shattered glass of broken incandescent bulbs. Light bulb included. 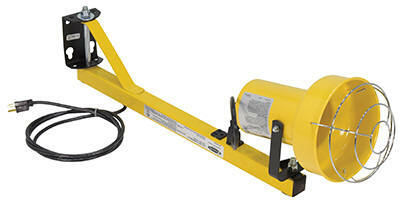 Low profile, flexible task light, ideally suited for loading dock applications. Its 27” flexible stainless steel neck can be easily rotated and position to light with minimal obstruction to the loading dock area. 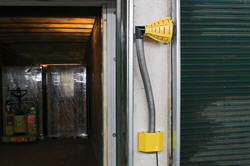 The dock lights narrow profile and flexibility enable it to be mounted between two neighboring loading docks. 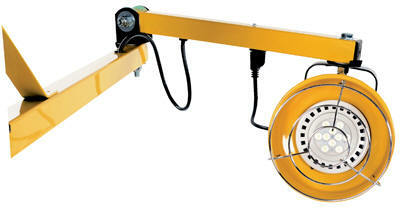 With the simple mounting method and ability to be positioned precisely, it is an ideal task light for use around work stations and machinery. UL listed.